The building that houses E. Shaver, Bookseller was built in 1842 by Eliza Jewett, a female builder, for her personal residence. It also was the home of an antiques shop for a time in the 1950's. In 1975 Ed and Esther Shaver, a newlywed couple from Louisville, KY, visited Savannah on their honeymoon. They fell in love with the city and decided to stay. Esther was already a successful business woman with five thriving bookstores and Ed was a prominent contractor. 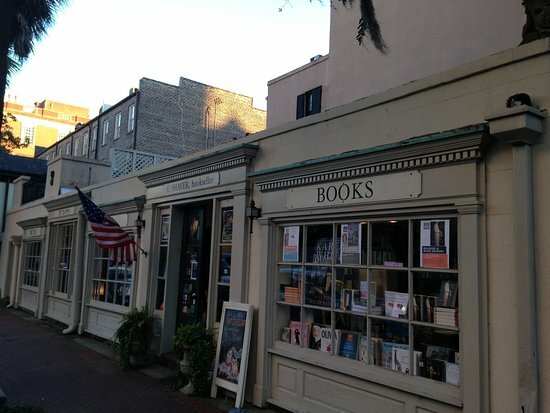 They each sold their respective businesses and set up shop in Savannah, opening E. Shaver, Bookseller in 1975. Esther sold the shop in 2015 to the current owner, Jessica Osborne. Jessica had been an employee of the store for several years and the business has continued to thrive under her leadership. Not long after Jessica took the reigns, a pair of delightfully fluffy bookshop cats, Bartleby and Mr. Eliot, joined the management team. A scrappy little foundling named Skimbleshanks came on board in 2018, rounding out the trifecta of cats to the delight of our customers.